Transformations happen all the time. You see people make changes in their diet and exercise and lose more than 10o pounds. Each Spring we see seemingly dead and dormant trees, bushes and flowers burst into life. How many of us look at our lives and think that they won’t amount to anything? We aren’t smart enough, not fast enough, not pretty enough, not talented enough or just not enough enough. Yet we fail to consider the work that God may be doing in us. 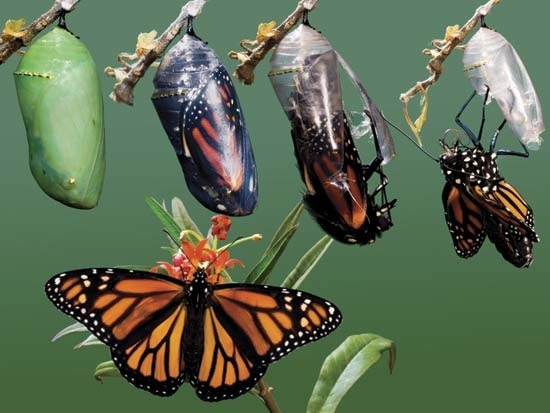 Who knows you may still be a caterpillar. God may not be finished with you yet. Referring to Himself, Jesus said in John 12:24, “Unless a kernel of wheat fall so the ground and dies, it remains only a single seed. But if it dies, it produces many seeds.” If we allow God to change our one and only life, what might He produce through it. Staying the same is safe. To change is to risk. Who knows, if you risk, you may fly. ~ by mikefoster on May 22, 2013. Great post, Mike. Really needed to read that today. Thanks for sharing. From one caterpillar to another!